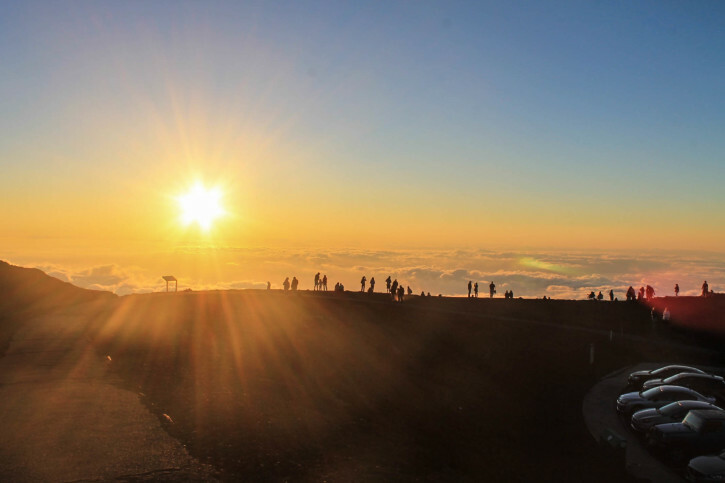 Discover what it’s like to experience the Haleakala Crater hike – one of the top hikes in Maui, Hawaii. As soon as our plane leaned towards the windswept palm trees on our descent down to Kahului Airport in Maui, I had a feeling of instant joy spread through me. A small sigh of relief escaped my lips when we landed on the tarmac with little to no turbulence, a feat for the windiest airport in Hawaii. 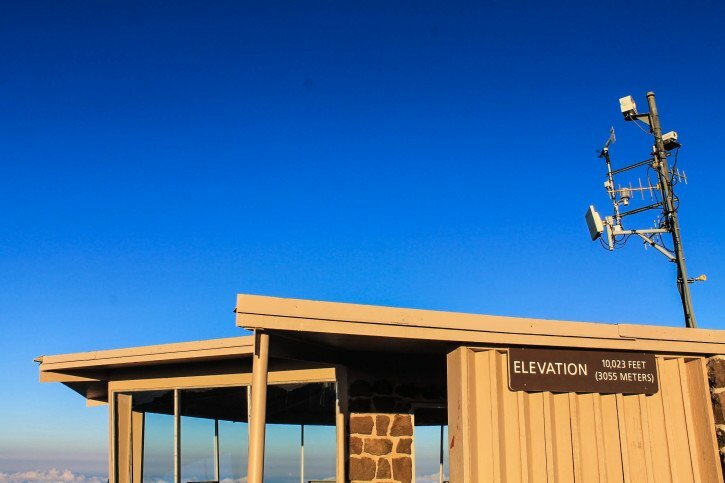 Coming into Maui from above, I was able to look over the landscape and see exactly what activities were in store for me – most notably, conquering Haleakalā Crater hike – the largest dormant volcano in the world. 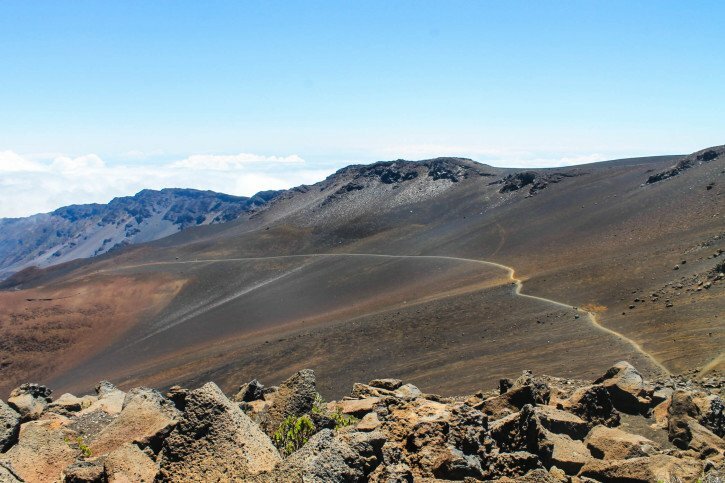 The volcano stands at over 10,000 feet and is one of the major adventure activities to do in Maui. There are bike tours at sunrise, hikes, or even bus loads that quickly take you up to the top and back down if that’s more your style. When looking at accommodation in Maui, our main goal was to find a place that was affordable but also one that offered a lot in amenities since we wouldn’t have a car to get around. We found Banana Bungalow, not the best location on the island, but a hostel that offered free tours 7 days of the week. 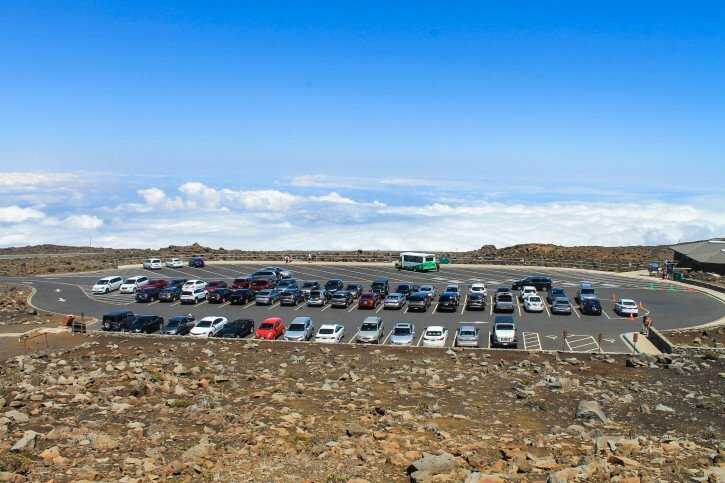 Their Saturday tour is the extensive 12-mile Haleakala Crater hike which goes through the volcanic crater of Haleakalā National Park, and a trip to the summit to watch the sunset above the clouds at the end of it. 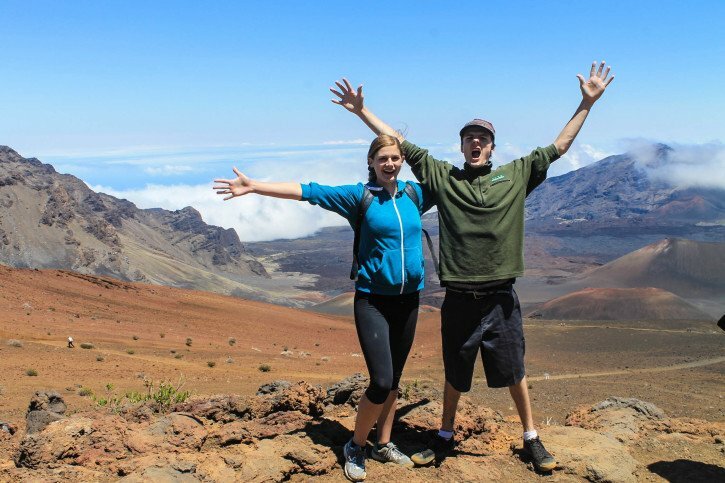 We signed up for it immediately when we checked in since it is one of the top hikes in Maui and spots fill up fast and only a maximum of 27 guests can come every week. We snagged two of the last spots and gleefully looked forward to our early morning wake up call on Saturday. 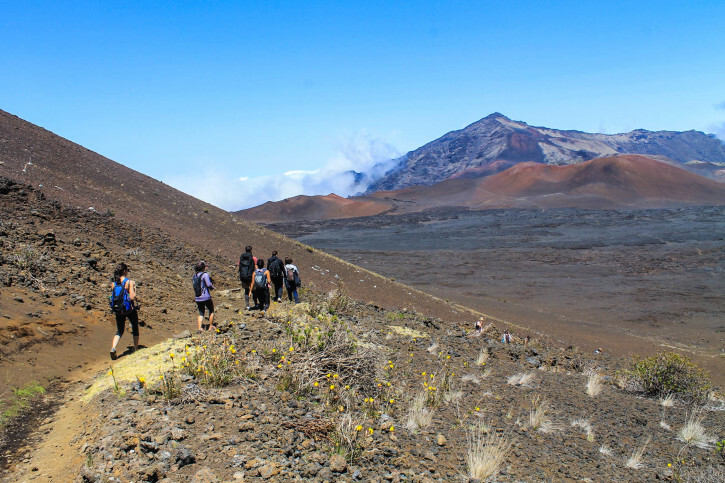 We knew we would be in for an epic day with one of the best Maui hiking tours that went from 8:30 am to 8:30 pm and a 12-mile hike of varied terrain in between that. We groggily hopped in the van on Saturday to leave at 8:30 am sharp and made our winding way up to the starting point of the Haleakala hike. As soon as we jumped out of the car we were thankful we had brought an extra layer of warm clothing. Even though it was sticky and hot back at the hostel, we knew it would be about 30 degrees colder once we reached the summit, so this was just the beginning. 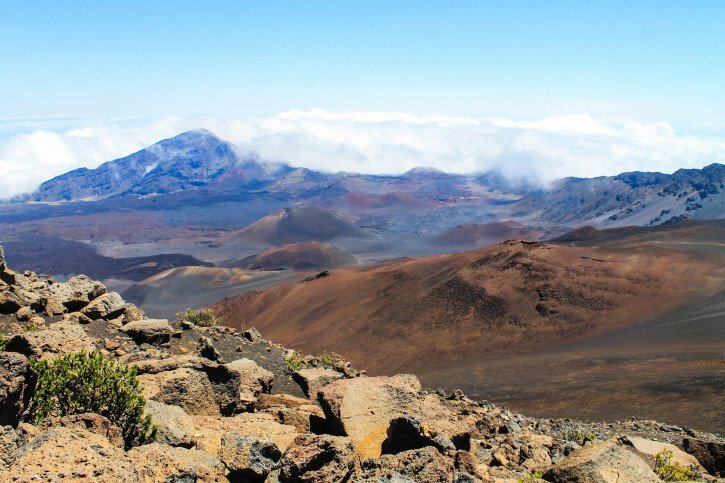 To give a background to the history and folklore of the volcano, its name Haleakalā means “house of the sun” and the summit was said to be the home of Maui’s grandmother. For those of you who don’t know Polynesian and/or Hawaiian folklore, Maui is the demigod in many legends. 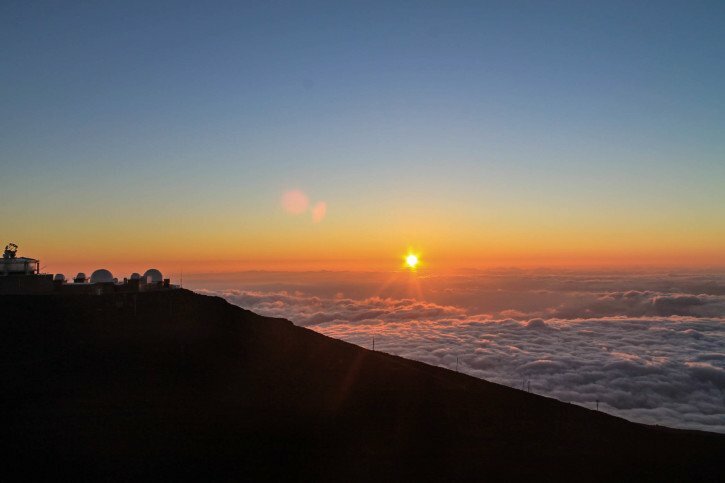 He is said to have created the Hawaiian islands and to have slowed the sun from its rapid progress to create longer days. Maui’s Grandmother was meant to have helped him capture the sun and help slow its movement in the sky. 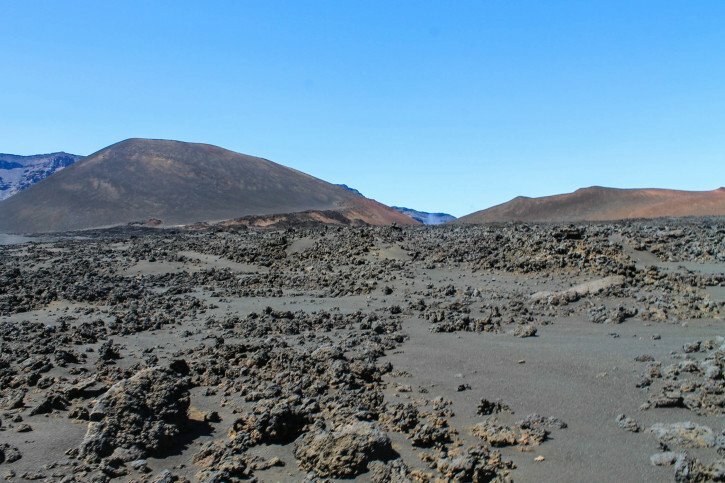 We set out from the trailhead at the visitor’s center and started on one of the longest Haleakala National Park hikes into a landscape that looked straight out of a movie about planet Mars. Red, shaded brown, and silver earth was around us for most of the Haleakala Crater hike with few shrubs and plants along the way. 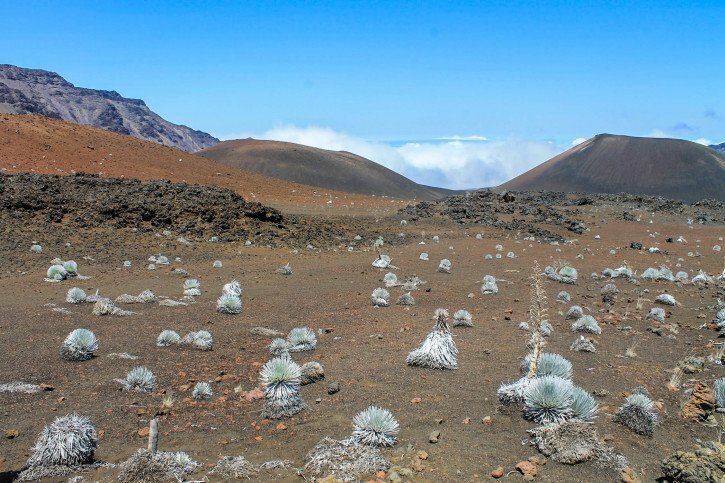 The most famous native plant that you’ll find here is the Silversword, a rare flowering plant that is only found in Haleakalā National Park, which is one of many reasons why the National Park is one of the best places to hike in Maui. 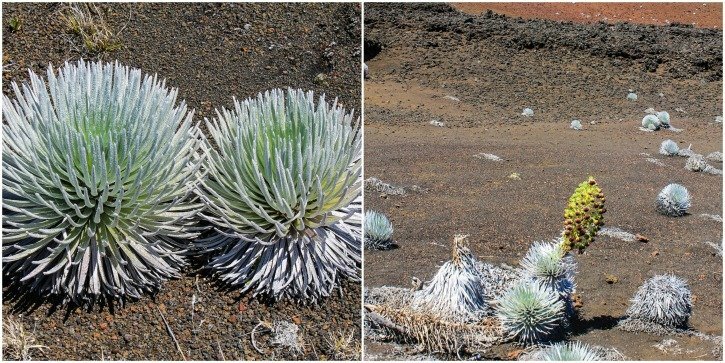 Silverswords can live anywhere between 3 and 90 years and only flower once before dying. We saw a couple of leftover blooms during our trek, but the season for them being in bloom had already recently passed. Regardless, it was an amazing sight to see all of these bright silver plants knowing that this is the only place I will ever be able to see them in nature. 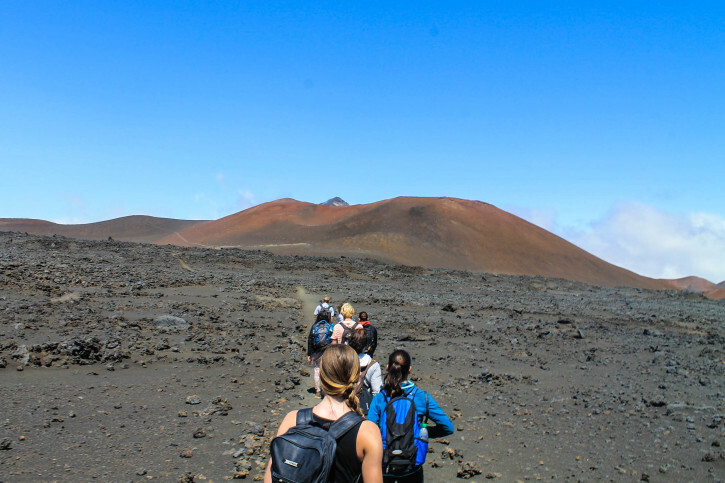 Throughout our long Maui volcano hike, we came across every imaginable volcanic terrain. The rust-colored earth beckoned us to keep moving our feet forward, and we were rewarded with views that could best be described as landscape paintings with the most delicate brush strokes. The earth radiated multi-hues of red and brown, it was dusty yet tropical at the same time. I’ve never experienced anything like it. This hiking in Maui, Hawaii journey was long but we took multiple stops along the way to enjoy our surroundings, have a chat with our neighbor, or nibble on the snacks we had brought with us from the hostel. Luckily, hiking groups are only allowed to have 12 hikers in each party including the guide, so our group was relatively small and could keep up a decent pace. We were the first group of the Haleakala tours to finish the treacherous switchbacks at the end of the hike. Steep and crumbling, the switchbacks made me partially understand what a mountain goat must have to go through on a daily basis. This was the steepest part of the of Haleakala Crater hike and every time I briefly stopped to glance behind me, I quickly lost my breath with the elevation gain and the beauty of the crater laid out before me. It was a sight I will not soon forget. 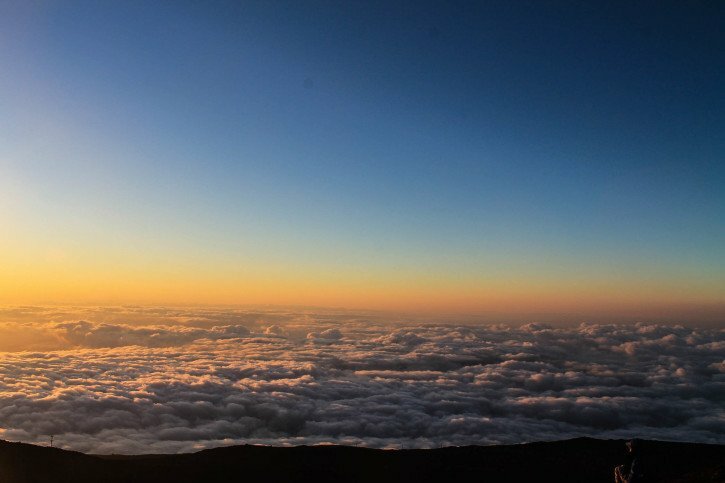 Anyone who is looking where to hike in Maui, I recommend the Haleakala Crater hikes simply for the views. Those feelings of pure happiness and contentment came back to me in those moments, similar to when we had initially landed on the island. Even with me sweating and huffing profusely, I couldn’t help but laugh at how happy I was to be there. Once we arrived at the end of the trail and a zillion switchbacks later, our trip wasn’t quite over yet. 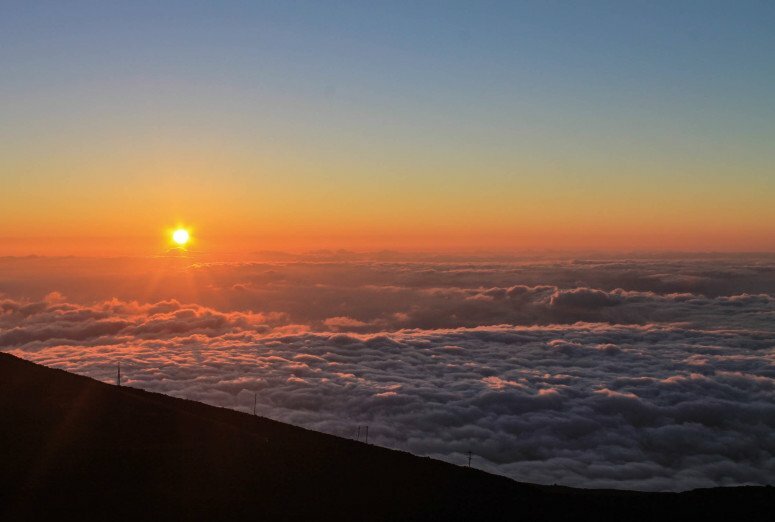 Now came the experience we had all been waiting for, seeing Hawaii above the clouds, and a chance to watching the sunset from over 10,000 feet up in the sky at the summit. We were whisked away in our van from the visitor’s center we had stumbled into and taken up to the very top. We couldn’t have timed it more perfectly, the sun was on its descent within 15 minutes. As soon as the sun started going down, the Haleakala summit weather started to hit us, and the temperature quickly dropped to freezing and even my extra layer wasn’t keeping me from shivering. 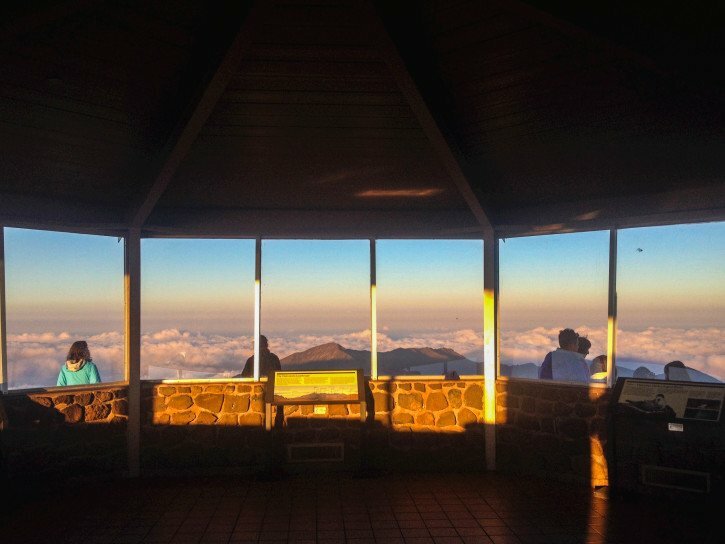 We spent a lot of time in the Haleakala observatory that gave a 180-degree view of the vivid cloud covering, and ran out just before the sun started going down to sit on the ridge with the rest of the 50 or so people taking in the view. It was my first time watching the sunset above the clouds, the only way I could describe it is magical. I looked over at my Kiwi travel partner and beau who had already journeyed over 4,500 miles to share this experience with me. We smiled at each other without a word, understanding how far we had come to reach this point and knowing that this was just the beginning of our adventure. As the last ray of sun fell beneath the clouds, I could easily say that it was the happiest moment of my time in Hawaii. We all made a bee-line to the parking lot in shivers and chattering teeth to enjoy the warmth of the van. We excitedly started talking about what a great day it had been on one of the top volcano tours in Hawaii, but a silence quickly overtook us as we winded back down to our hostel. All of us exhausted from enjoying one of the best Maui hikes but content beyond words, an easy smile on our lips to have had a day we would be telling in our old age one day. There was no need for words to describe it just yet. After spending the day exploring the Volcanoes in Maui and enjoy Haleakala Crater hiking, relax at Montage Kapalua Bay. This luxurious resort is the perfect destination for anyone who wants to enjoy perfect Hawaii views and an extensive range of amenities. The 24-acre resort has stunning ocean views and is close to a golf course and beaches. Guests can enjoy the on-site outdoor pool, restaurant, spa and health club. The Maui Beach Hotel is a stunning hotel with ocean view rooms that will not break the bank. The hotel is located about 5-minutes walk of shops and restaurants as well as Hoaloha Park. Guests can enjoy the on-site pool and fitness center. The hotel offers a breakfast and dinner buffet at the Rainbow Terrace dining room, and drinks at the poolside Lokelani Lounge. The Northshore Hostel Maui is an excellent option for anyone who is looking for budget-friendly accommodations. The hostel is located near Iao Valley State Park, Iao Needle Monument, and Maui Academy of Performing Arts. The hostel serves an American breakfast and offers guest closet space, free WiFi and shared bathrooms. 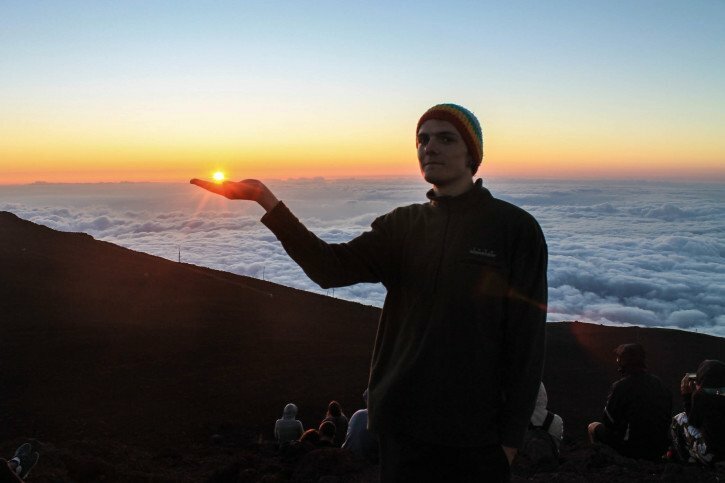 Early risers can skip the Haleakala sunset hike, and book a once in a lifetime Maui sunrise tour that allows you to watch the sunrise from the top of Haleakala. 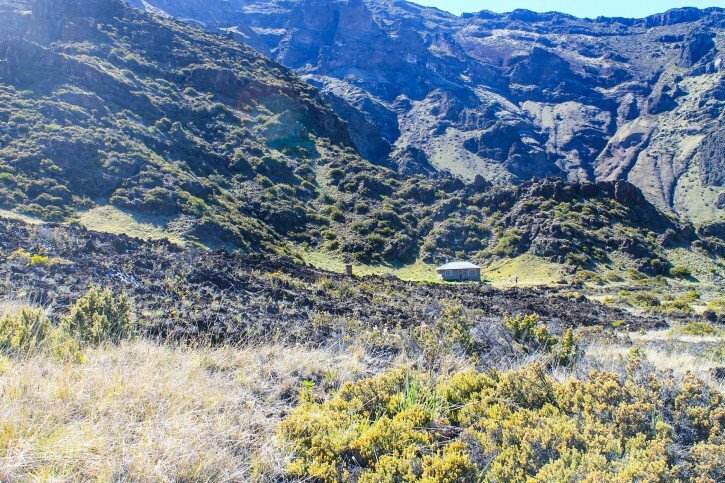 You will learn about the history of the park, enjoy the experience of hiking Haleakala and take in the stunning views all before breakfast. A trip to Hawaii is not complete without whale watching. Every year humpback whales migrate to Hawaii from Alaska. Enjoy a breathtaking and unique experience of whale watching in the protected Hawaiian waters. Enjoy snorkeling in the extinct volcanic crater of Molokini. As you snorkel, you will be able to explore the marine life and make your way to Turtle Town where you can swim with the Hawaiian Green Sea Turtles. 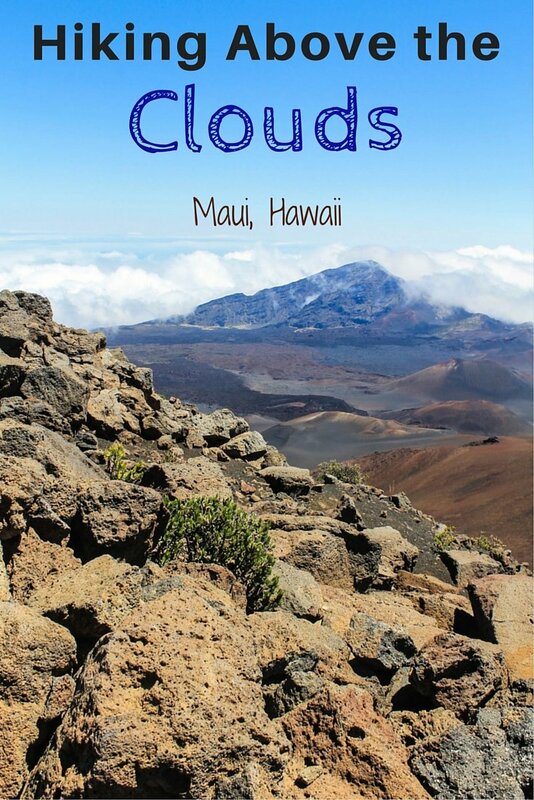 Buy your Maui Travel Guide here. NEED HELP PLANNING YOUR TRIP TO HAWAII? FIND INSPIRATION FROM THESE BLOG POSTS! Wow! 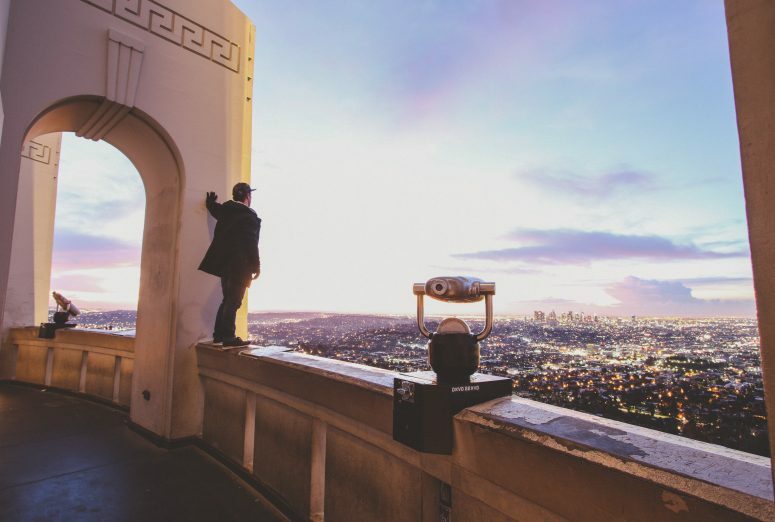 These views and photos are amazing! Hawaii is definitely on our short bucket list of places we want to visit and these photos are just making me want to go even more! I’m definitely saving this to remember for whenever we are able to make a trip! Hawaii is a great one for the bucket list, you’ll love it over there Libby! How amazing is this?! I would love to ok on a hike like this! I’m off to Hawaii next month but not Maui… maybe next time. Thank you for sharing! You can’t go wrong with Hawaii, thanks for reading Ashleigh! Your pictures are absolutely amazing! 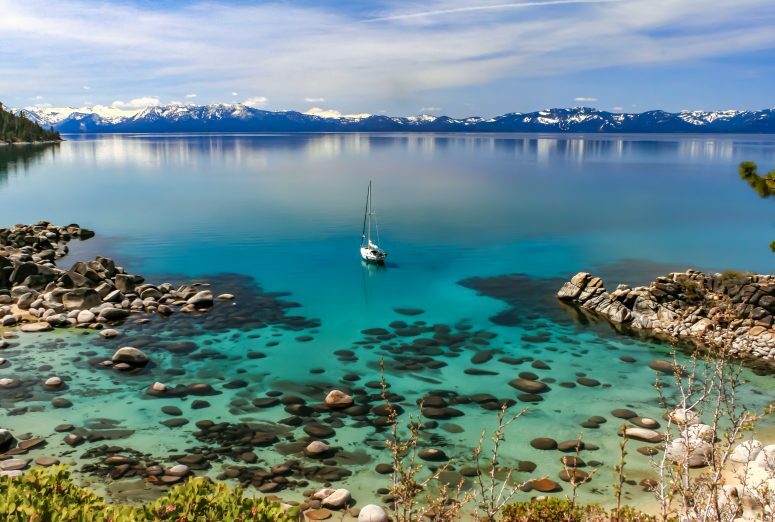 I did this hike once on a cruise and it was an amazing experience! Thank you Anna, isn’t it amazing!? Incredible! What an amazing experience that must have been. I definitely need to go to Hawaii. I hear so much about the amazing hiking opportunities from my friend who goes to school there! love love love this post! 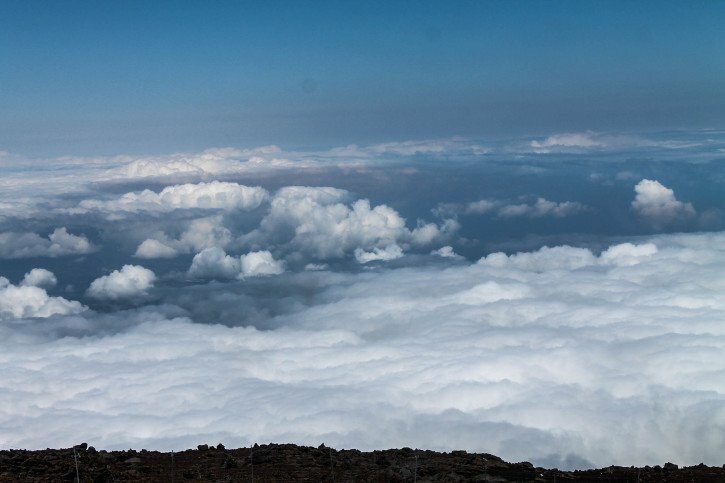 I have been to Maui once and did not make it for this hike…I hope to next time! I hear on a clear day up there you can see all the Hawaiian islands! That hostel sounds great as well…I love to write posts about Hawaii..!! There was so much I missed in Maui in the short time I was there as well. Luckily, it’s one of those places that easily beckons you back. I really want to see all the Hawaiian Islands too at some point, such a stunning area of the world! These pictures are beautiful. I’ve hiked in the clouds, but never above them! Amazing! Thank you Nicole, above them was a new experience for sure! Wow! That must have been the most amazing experience, the photos you took are stunning! It was such a COOL experience Courtney! Absolutely breathtaking. I love the scenery of different locations and this is now on my list of places to check out! Hawaii has some of the best scenery Ashley, sometimes you have to pinch yourself to remember its real. Maui is a great place to check out with all of the adventure activities in beautiful spots! This is absolutely gorgeous! 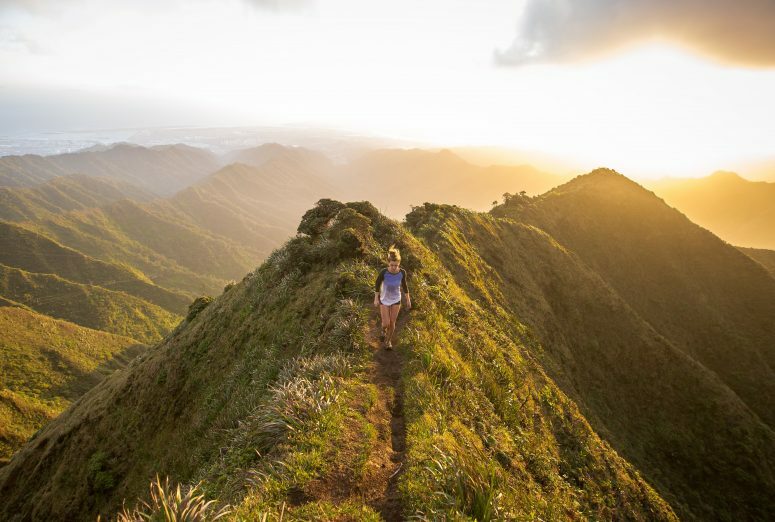 I would love to visit Hawaii someday and go on a hike. I have a friend who lives there and she loves it there! Hawaii is great for hiking, I hope you get there Keating! So cool! I’ve driven up to watch the sunrise from the top there and that was an experience I’ll always remember. I didn’t know there was a (very long) sunset hike option. Adding to the bucket list!! 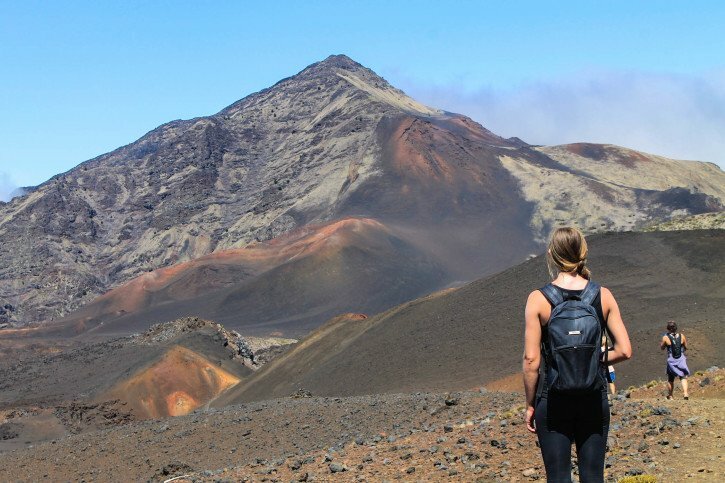 The hike was very long, but so worth it once we got to the top – I never knew volcanic landscape could be so versatile. Definitely a must-do in Maui! 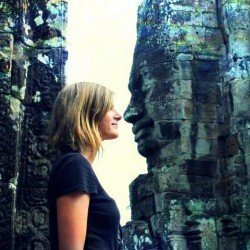 This seems like an awesome place to visit! Beautiful photos, Mimi! Thank you! 🙂 I love Maui. A joy to read and your images are lovely!